FIRST OF all, let me express my belated thanks to Mrs. Sylvia Palanca Quirino and the Palanca Foundation for responding promptly to our recent appeal for them to reconsider and rescind what many writers thought were rather onerous rules for this year’s Palanca Awards competition. That has happened—we’re basically back to the old rules, which prospective entrants can read on the Palanca website. I do have to remind people to mind the check box on the entry form, where you need to indicate whether you’re giving your express permission for the Foundation to publish your work in full, in case it wins. We can understand the Foundation’s desire not just to give away monetary prizes for literature as it’s done for over 60 years now, but also to develop a readership for good writing. That’s why it’s important to strike a balance between the authors’ rights to their work and the sponsor’s need to share some of that work with the public for whom it’s presumably being written. As someone who’s come to be associated, and happily so, with the Palanca community, I’m relieved that this little tempest was dealt with expeditiously and reasonably by the Palancas and their lawyers—with the personal and gracious intercession, of course, of Mrs. Quirino. 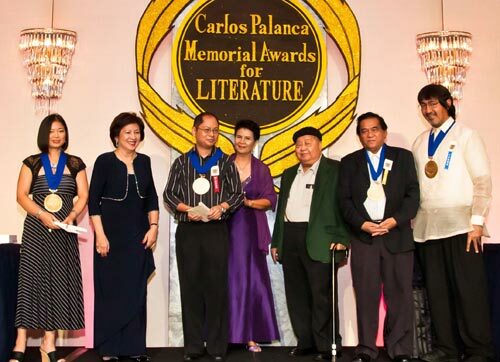 I should note that both sides came away with the clear understanding that the rules are a work in progress—as are the Palanca awards themselves—as the literary and publishing environment itself continues to evolve in ways no one could have predicted, say, 20 years ago. They will be reviewed and modified as the times require, but meanwhile, it’s back to the old rules (minus the retroactivity provision, which turns out to have been there before with hardly anyone noticing; at least the recent discussion surfaced that). Thanks, too, to other stalwarts in the literary community such as Krip Yuson, Karina Bolasco, and Andrea Pasion-Flores who also worked behind the scenes to help clarify and resolve issues. On the sidelines, this brouhaha raised some old, perennial questions, mainly from younger writers. For example, I received another message on my blog asking if it’s absolutely important to join the Palancas and win a prize or two to gain literary recognition. My answer has always been, of course not—not absolutely. I’m sure that many accomplished authors never joined the Palancas nor won one of its many prizes; quite a few, both old and young, disdain the idea of joining for their own reasons, chiefly the distastefulness of seeming to curry favor with the literary Establishment. From a practical standpoint—and I’ve always been a practical man—I have no doubt that a Palanca award or two, or better yet a dozen, can help perk up the CV and gain some attention from editors, publishers, and grant-givers (if that sort of thing is important to you at all, because it may not be and doesn’t have to be, if you’re independent-minded and/or have independent means). That may sound a bit crass to the idealist, but it’s never really been just about the money—which is appreciable but not all that much in the grand scheme of things. It’s about the inner lift you get from a bit of validation from one’s peers and seniors (and again, if you don’t need or want that validation, feel free to look elsewhere). And that, too, has practical effects, as the encouraged writer produces more (and, over time, hopefully better) work. Writing is a lonely job; there’s very little popular but credible criticism in this country that deals with contemporary literature, especially of work written by writers 40 and below. With very few readers and critics about, the only quick check you might get on your work could be that prize (ie, from your readership of three judges)—or its absence. It’s a sad thing to note, in a way, but that’s how it is. I can’t speak for everyone else, but I’ll just say what it was like for me. When I began joining the Palancas in the mid-1970s, I didn’t know anyone and nobody knew me. I was a college dropout, and hadn’t even gone to a writers’ workshop then. I took my chances, and lost more times than I won. I won a share of second prize the first time I joined, in 1975 when I was 21 (after which I naturally felt like God’s own child), but this was followed by a straight and miserable four-year losing streak. Whenever I lost, I felt sick to the stomach and couldn’t wait for another year to roll over as quickly as possible. But I didn’t curse the heavens or the judges. After sulking for a week, I went back to my desk—reading writers I could learn from—and wrote more stories and plays (many of them lousy ones for sure, but even bad work strengthens some muscles) and joined and lost and joined again. It comes down to this: one or two or even a whole raft of Palancas won’t make you a writer, or make you as a writer. They’ll give you a helpful leg up and make you feel like a king or a queen for a week—you’ll certainly be the most famous writer in your barangay—but ultimately, the awards will only be as good as you make them, as you parlay them into good, sustained writing and publishing. Forget those three-person boards of judges and their foibles; worry about the faceless thousands of readers out there you’ll never see, but who will all have something to say about your work (or worse, prove indifferent). At some point, stop worrying about prizes; worry about your next book. That’s what people should best remember you by. This entry was posted in Art & Culture, Pinoys, Writing and tagged awards. literature, controversry, Palanca, rules by penmanila. Bookmark the permalink.